December 14, 2013 Filed in Photography, Randomness, This is My Oakland! 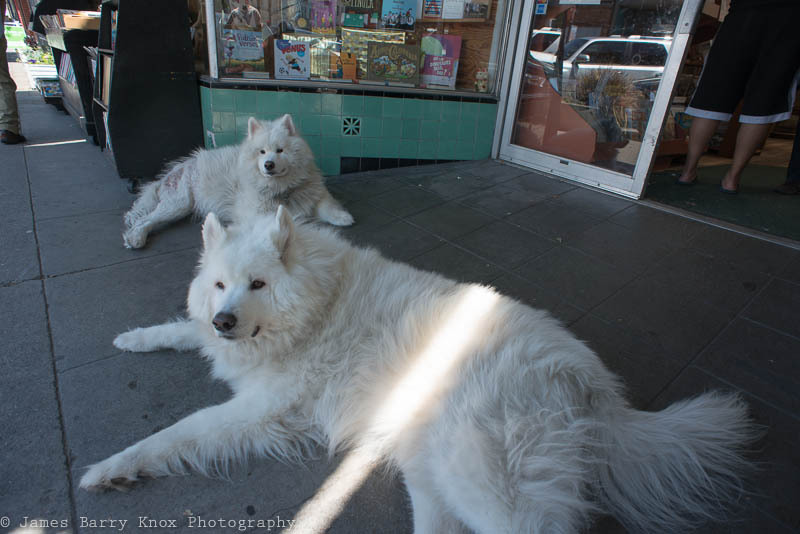 One any given day on Grand Avenue in Oakland, it was not usual to see these two Samoyed brothers, Kip and Amos, laying in front or inside Walden Pond Books. I would always stop to pet them whenever there were there. On a recent visit, only Kip was in front of the store. The owner came out and I asked where was Amos and he informed me that Amos had recently died of cancer. He was twelve years ago. I mentioned to him that I had recently seen him walking the two Samoyeds and a Samoyed puppy near Lake Merritt. The puppy, Scout, is a new addition to the family and Amos got to meet her before his passing. allison - Each time I visited my son in Oakland I made sure to visit that bookstore and would marvel at those two big beautiful dogs. Always looked forward to seeing them. Can’t imagine their feeling of lose. kate - bless them both. James - I was sad to learn that both Kip and Amos has passed. God bless them both.